There are thousands of these window locks which are now obsolete, however, we have a selection of old and new window locks that should suit most uPVC window systems. We are also able to locate old window locks from the past 25 years, so please enquire if you have a certain window lock that your looking for. 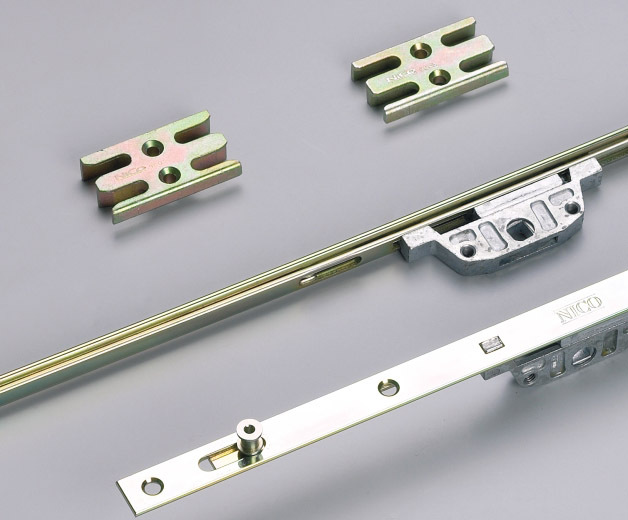 The VITA window espag lock we use ourselves and sell is the nearest to a universal window locking system we can find and will replace most uPVC window locks to date. These window locks are fitted mainly to uPVC windows but are found on some aluminium and wooden windows also. Rail length - this is the total length of the rod from end to end. The distance between screw hole centres - 43mm is the industry standard for almost all Espagnolette rods. Cam height - this is the height of the projecting locking part on the rod. Today this is often called a mushroom cam due to its shape. Mushroom cams can be used to replace roller cams without problem. The backset - this is the horizontal distance from the face of the lock to the centre line of the handle screw fixing holes. Rail width - this is the width of the rod from side to side and almost always 16mm. Selection of old and new window locks made by all major manufacturers. Avocet inline gearbox, 16mm rail width, window lock/espag.Espagnolette (also referred to as 'espag').. Replacement Avocet WMS U Rail espagnolette multi point uPVC window lock should have either Avocet or..
KENRICK Sabrelock Window Gearbox - Hook StyleFeatures:17mm Backset43mm screw centres124mm lock posit..
Large Ideal Finger Operated ShootboltFinger operated shootbolt for use on slave doors (top and botto..
MACO MK1 Espag Gearbox With CoverThis MACO MK1 centre case espag gearbox from Maco is a reverse acti..
MACO MK1 Espag Shootbolt Extension Rods (pair) - CroppableThis MK1 espag extension rod from Maco is ..
MACO Flat Rail Offset Espag Window Locking MechanismThis Flat Rail Offset Window Lock is the ty..
Mila Roller Cam Window Lock Espagnolette - designed for use on top hung and side hung casement windo.. Pro Gearbox and Shootbolt Espag Window LockThe Pro shootbolt espagnolette window locking system, man.. Pro Gearbox Shootbolt Extension Rods (rods only) (pair) The Pro shootbolt espagnolette window l.. The RetroFit 8-in-1 Window Lock Espagnolette is an ideal replacement for old style 13mm window locks..
Schuco Replacement Tilt and Turn Window Gearbox (43mm)43mm refers to the distance between the 2 fixi..
SPILKA Replacement Centre Gearbox 7mm..
SPILKA Replacement Centre Gearbox 8mm..